A few weeks ago, Beebe Healthcare’s Intensive Care Unit (ICU) was able to facilitate an organ donation that saved a patient who had been waiting for a liver transplant. Because of the team’s quick actions and dedication to organ donation, a person who could have died within a week was given a life-saving organ transplant, said Diana R. Kline, Hospital Services Coordinator for Gift of Life Donor Program. 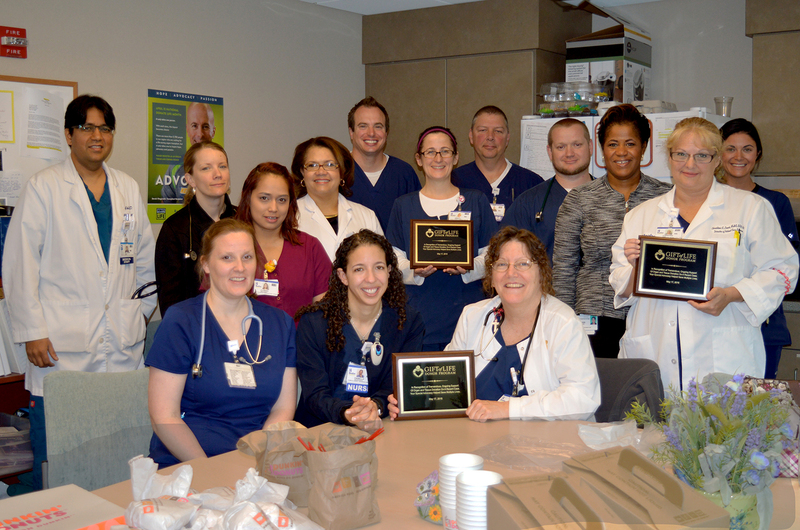 Ms. Kline visited Beebe Healthcare on Tuesday, May 17, to present plaques to members of the Intensive Care Unit and Cardiac Catheterization teams. Plaques were presented to the ICU team and to Dr. Firas El-Sabbagh of Beebe’s Cardiac and Vascular Services, who was on-call and able to provide important information needed to approve the organ donation. “The Beebe Healthcare team truly went above and beyond to honor the wishes of this generous donor and their family, and helped them to save a stranger’s life,” said Ms. Kline. There are currently 5,700 people on the organ transplant waitlist in the region. Nationally, on average21 people die every day waiting. To register as an organ and tissue donor, visit www.donors1.org. It only takes 30 seconds to register. Standing (left to right) in back are Madan Joshi, MD, Board Certified Pulmonologist and Medical Director of the Intensive Care Unit; Jenn Noonan, RN; Clarisa Abellanedu, Unit Secretary and Monitor Technician for the ICU; Ercilia E. Arias, MD, FCCP, Board Certified Pulmonologist; Derek Eckenrode, RN; Holly Douglas, RN; Karl Thomas, RN; Chris Burke, RN; Diana Kline, Gift of Life Coordinator; Christina Lewis, MHA, BSN, RN, Director of Patient Care Services; and Dana Ayers, RN. Sitting are Jill Petrone, RN; Danielle Fraundorfer, RN; and Cathy Robinson, RN. Missing from photo are Dawn Pasta, RN. Diana Kline, Gift of Life Coordinator, also presented a plaque to Firas El-Sabbagh, MD, Medical Director of Electrophysiology for Beebe Healthcare’s Cardiac & Vascular Services. Dr. El-Sabbagh was the on-call physician in the Cardiac Cath Lab and helped facilitate the necessary paperwork for the organ donation.